Appearance: The cobra was almost always portrayed rearing up and with its hood dilated. The Greek word uraeus is typically used to describe the cobra in this pose. The word may have its origins from the Egyptian words which meant "she who rears up". The species of cobra represented as the uraeus is the Naja haje. Meaning: According to the Story of Re, the first uraeus was created by the goddess Isis who formed it from the dust of the earth and the spittle of the sun-god. 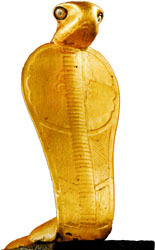 The uraeus was the instrument with which Isis gained the throne of Egypt for her husband Osiris. The uraeus was a symbol for various things from early times including: the sun, Lower Egypt, the king and a number of deities. As the sacred creature of the Delta city of Buto, the reptile was known by the same name. She soon became an emblem of all of Lower Egypt. The uraeus was often depicted with the vulture Nekhebet who served the same function for Upper Egypt. Together they symbolized the unification of the two lands. The creatures also appear together in the pharaoh's nebty or "Two Ladies" name. The cobra was also called the "fiery eye" of Re and two uraei were sometimes depicted on either side of the solar disk. A gilded wooded cobra called netjer-ankh ("living god") was found in the tomb of Tutankhamon (see picture at left). It is representative of the cobra's associations with the afterlife. In funerary works, the cobra is often depicted spitting fire. Two cobras doing just that were said to guard the gates of every "hour" of the underworld. During the Late Period, uraei were also shown towing the barque of the sun in funerary papyri. In all of these examples, the cobra's protective nature is clearly demonstrated. The cobra was also representative of various deities such as Neith, Ma'at, and Re.